The world of mobile applications has opened a new channel that allows businesses to communicate and engage with customers-in innovative, dynamic ways. A well-designed app, tailored to its audience, has the power to increase customer loyalty, encourage more frequent interactions, and drive sales. If poorly designed, it runs the risk of falling into the vast pool of mobile apps that are used only once, then abandoned. 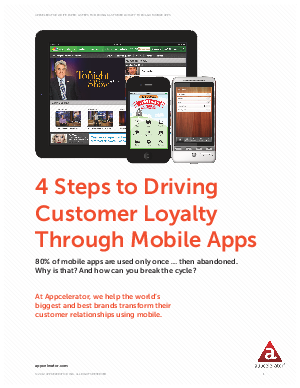 In a white paper from Appcelerator, discover the keys to creating "sticky" mobile apps that keep customers coming back, again and again. Using the four components of the mobile relationship lifecycle-reach, loyalty, engagement and monetization-as guides, you'll learn about the most effective ways to connect with customers at the right time, on the right mobile device. Plus, you'll get an inside look at how NBC Universal became the most popular destination in the mobile app store.